You’ve made the first step in protecting your peace of mind when away from home by purchasing a security camera. But once it’s installed, how do you store all the footage that’s being captured? Just like the hundreds of snapshots you take with the camera you bring on vacations, finding a place to unload all that data can be the trickiest part of planning your at-home security system. Here, we break down your storage options between the cloud, SD cards and the paid services that some camera brands offer. Secure your home through the power of cloud technology. This allows you to check on the state of your home from anywhere at any time, simply by signing into an online portal that syncs with your security camera. When purchasing a video camera, you’ll want to look for one that bills itself as a cloud network camera. That way, you’ll have free access to its corresponding browser and app portals. Through this web interface, you can monitor your camera’s video feed at any time, whether or not the system has received a motion detection alert. If you’d just like to see what your dog is up to in the living room while you’re out, you can navigate over to the cloud streaming service to find out. While the service of live feeds might be free, actually holding onto the footage from that stream will be an additional cost. You’ll need to purchase a separate device to record what’s playing on the live feed, as well as a hard drive to sync with the camera recorder. Some Wi-Fi-enabled security cameras will store recorded footage for you if you’ve paid for a subscription plan. Models like the Nest Cam have Nest Aware, a service that can be purchased in monthly or annual payments and with two rate tiers. For $10 per month or $100 per year, Nest Aware will store 10 days’ worth of video history recorded on the Nest Cam. A 30-day video history plan is also available for $30 per month or $300 per year. This means you’ll have continuous 24-hour recorded streaming. With many paid subscription services like these, the program will alert you to the parts of the recording where activity was actually detected, saving you from the tedious task of having to scan through all that footage. Like a point-and-shoot digital camera, many security camera options require an SD card to record the footage it’s seeing. A 32GB SD card can cost as little as $10 at most major retailers. In many camera models we’ve seen, about 65 hours of footage can be captured. Rather than swapping out SD cards filled with a constant recording stream every few days, most of the cameras that use memory cards can be set to record video only when motion is detected, which will greatly limit how often you’ll need to clear the SD card’s data. A pain point to consider when going the SD card route is how likely you will be to actually remove the card from the camera, insert it into a computer and scan through the recorded footage. If those additional manual steps are likely to keep you from actually monitoring what is being recorded in or around your house, you might want to consider the internet-based options described above. 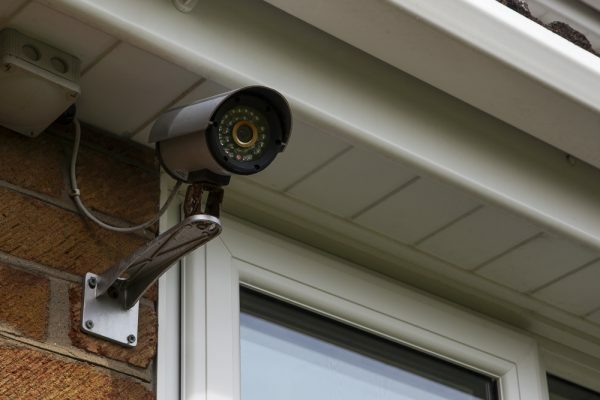 Before purchasing your home’s security camera, you’ll want to consider the above storage means. If you want to access a camera stream from anywhere, while also physically recording it onto a hard drive, then select the cloud plus recording device model. Is it important to you to have every moment captured, not just when motion is detected? A subscription service might be your best option. If you’re using a video camera more as a crime deterrent and really only plan to look at footage in the case of something suspicious, a camera that records to an SD card makes a practical and affordable option. You can visit The Home Depot to find the security system and footage storage solution that works for you. Kelly Schwarze is a tech geek who shares her knowledge about gadgets and home automation for The Home Depot. She debunks myths and provides info on how home automation can be affordable. Visit The Home Depot to find a large selection of smart home products and solutions.